Kitty Softpaws (Salma Hayek) and Puss In Boots (Antonio Banderas) star in DreamWorks Animation's PUSS IN BOOTS. Photo credit: DreamWorks Animation LLC. ® and © 2011 DreamWorks Animation LLC. All Rights Reserved. Rated: PG for some adventure action and mild rude humor. Long before he even met Shrek, the notorious fighter, lover and outlaw Puss in Boots becomes a hero when he sets off on an adventure with the tough and street smart Kitty Softpaws and the mastermind Humpty Dumpty to save his town. This is the true story of The Cat, The Myth, The Legend...The Boots. Chris Miller is a born multi-tasker. Animator, story artist, performer, filmmaker--a graduate of the prestigious California Institute of the Arts/Film and Animation department, Miller commanded a successful career in commercial, video and film work before landing at the then-young DreamWorks Animation Studio SKG as a story artist on the studio's first animated comedy hit, "Antz." After that, he became a ground-floor member of an elite group that would change animation history: as a story artist on the Academy Award®-winning film, "Shrek," head of story on the hit follow-up "Shrek 2" and director of "Shrek the Third" (not to mention voicing several memorable characters along the way, such as beloved penguin Kowalski in the Madagascar films and Magic Mirror in Shrek) Chris found himself an integral part of the most successful animated film series of all time. It was while head of story on "Shrek 2" that Miller first 'met' the unforgettable feline known as Puss in Boots. Even then, he could tell the cat was destined for great things. Miller remembers, "Puss in Boots was such an important part of the success of Shrek 2, I felt it was only a matter of time before he broke out on to his own. He's such an appealing character, and it was clear that this guy needed his own tale told. I just gravitated towards that cat--this little package came with such a history behind him, you knew that there were endless stories and adventures. I always wanted to know, 'Okay, what's your deal? Where'd you get the accent? More importantly, where did you get the awesome boots? How did it all come together?'" Miller saw a multitude of characteristics that made the adventuresome feline irresistible: "There's a bit of the devil in him, which is what I really like about him, but he's still got this tremendous heart. Despite his size, he's this huge figure." Emmy-winning producer Joe M. Aguilar is also a DreamWorks Animation veteran, having served as a senior executive and key producer at the Company since its inception. Producer Aguilar sums up the appeal of Puss, "Out of all the characters you could call supporting, he's the character most people are very interested in knowing more about. In developing a feature about Puss in Boots, we went after something worthy of his character...something filled with comedy and adventure, something that really took advantage of how charismatic he is." Producer Latifa Ouaou was also there at the character's beginning, serving as Story/Editorial Supervisor on "Shrek 2." She shares her own reason why audiences embraced the swashbuckler: "What makes Puss in Boots so special is that inside this tiny, little cat is this huge personality with a deep voice. He's got so much ego, pride and bravado, and yet, you can distract him with a can of tuna or a spot of reflected light. I think that makes for an extremely loveable and comedic figure." Chris Miller felt so strongly about the character that he wanted to helm Puss's feature film debut: "I wanted to direct 'Puss in Boots' because I just felt that this character deserved his own origin story--although small in stature, he is larger-than-life. He's deserving of a really epically funny tale. I just wanted to be there when we delved into his world, something that really represented all of the facets of his character: he's little, but bold, dramatic, romantic. I think all that makes him perfect for a big movie." Such an idea had been a priority around the studio since the Tabby held his hat in his paws and gave audiences 'big sad kitty eyes.' According to producer Ouaou, "The movie really came together when Chris Miller came onboard to direct the project--he's been involved in all of the 'Shrek' movies and directed the third one, and he came from being a Storyboard Artist. He's a great storyteller who uniquely understood this character. Outside of his storytelling abilities, he's also just got a great visual sense. But on top of that, he's really about characters with depth, and the comedy really coming from these characters. I think that's what makes him really special." The director describes the film as, "A story about brotherhood that goes awry and turns sour, and ultimately it's about revenge and redemption...but at its core, it's a comedy. Puss is very funny. When we first meet Puss, he's an outlaw on the run, a fugitive from justice, racing from town to town--but we also know he's in search of a way to clear his name and right his past." 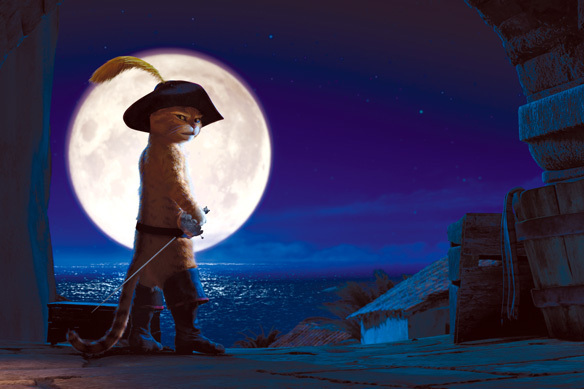 In telling the well known story of Puss, filmmakers looked beyond his fairy tale origin to find their own bracing adventure of how this cat came into legend. As with other self-created stories at DreamWorks Animation, an outline was created, with a talented group establishing the rhythm of the story beats--director, producers, head of story, writers and other development experts. Head of Story Bob Persichetti recalls, "The first movie I worked on at the studio was 'Shrek 2,' and the first sequence I worked on was the one that introduced Puss in Boots, so I've been involved with him, well, since the beginning, around 2001. And I feel that everyone knew, immediately, what a great character he was. He should have his own feature. " Persichetti states what may be obvious to anyone looking at the credits of the "Puss in Boots" team: "For most of us, it's like working with a family. In one way or another, we've all been with the character since he appeared. Chris' sensibilities and sense of humor are perfect for this story. And he's an incredibly collaborative artist, so heading up some 400 people--more than 600 at our busiest--seems totally right for him. He's great with pulling everything together and bringing out the strengths of everyone." 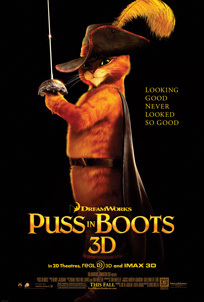 The legendary hero Puss In Boots (Antonio Banderas) stars in his own movie, DreamWorks Animation's PUSS IN BOOTS. Photo credit: DreamWorks Animation LLC. ® and © 2011 DreamWorks Animation LLC. All Rights Reserved. Salma Hayek voices Kitty Softpaws in DreamWorks Animation's PUSS IN BOOTS. Photo credit: Mathieu Young / DreamWorks Animation LLC. ® and © 2011 DreamWorks Animation LLC. All Rights Reserved. 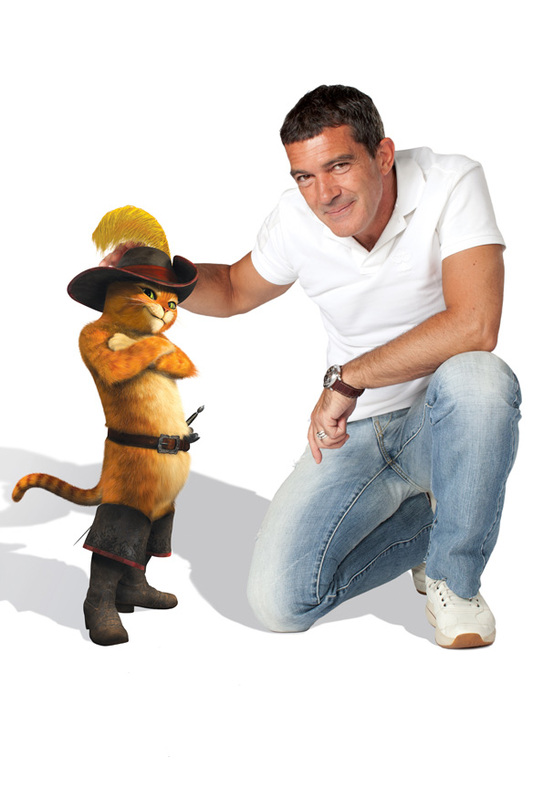 Antonio Banderas voices Puss In Boots in DreamWorks Animation's PUSS IN BOOTS. Photo credit: Mathieu Young / DreamWorks Animation LLC. ® and © 2011 DreamWorks Animation LLC. All Rights Reserved. 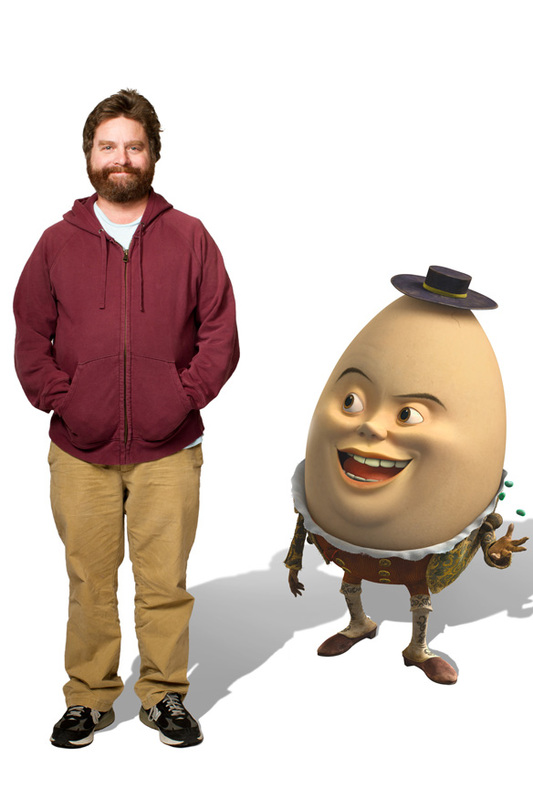 Zach Galifianakis voices Humpty Dumpty in DreamWorks Animations PUSS IN BOOTS. Photo credit: Michael Murphree / DreamWorks Animation LLC. ® and © 2011 DreamWorks Animation LLC. All Rights Reserved. 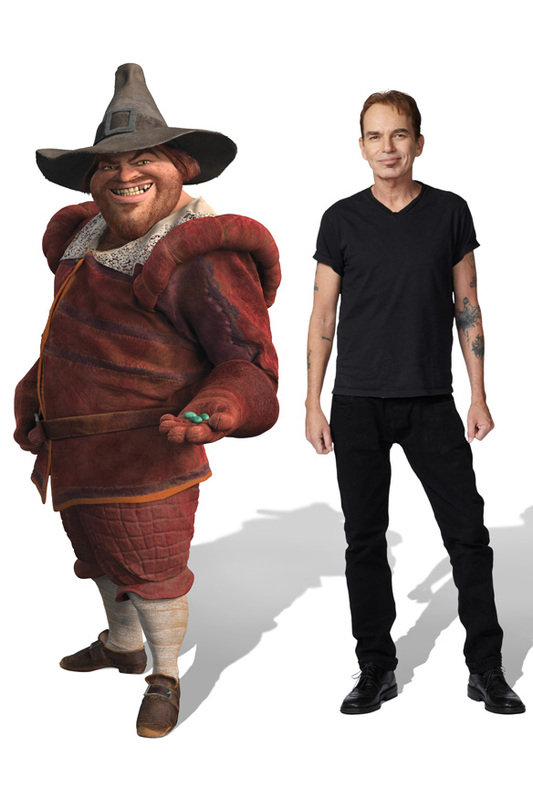 Billy Bob Thornton voices Jack in DreamWorks Animations PUSS IN BOOTS. Photo credit: Mathieu Young / DreamWorks Animation LLC. ® and © 2011 DreamWorks Animation LLC. All Rights Reserved. 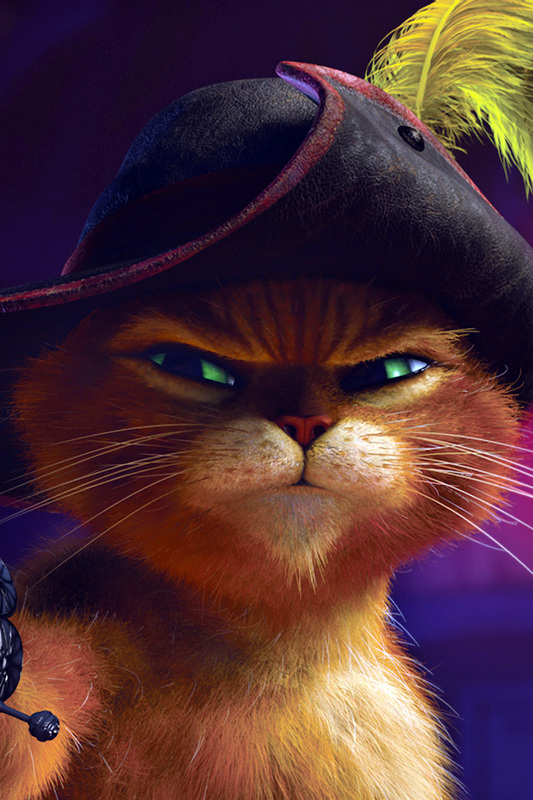 Puss In Boots (Antonio Banderas) stars DreamWorks Animation's PUSS IN BOOTS. Photo credit: DreamWorks Animation LLC. ® and © 2011 DreamWorks Animation LLC. All Rights Reserved.